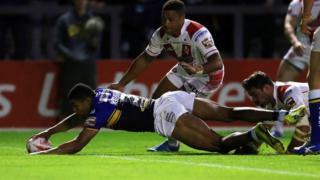 Challenge Cup holders beat Leeds Rhinos beat St Helens 24-14 at Warrington's Halliwell Jones Stadium to reach the final at Wembley for a fifth time in six years. In a last-four tie between Super League's two leading sides, tries from Zak Hardaker, Joel Moon and a superb effort by Rhinos veteran Jamie Peacock put Leeds in control at 18-4, but two tries by Mark Percival kept Saints in touch. 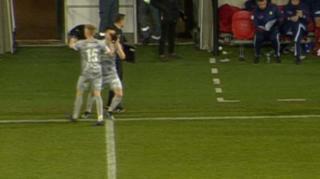 However, Kallum Watkins crossed late on to ensure Leeds will play Warrington or Hull KR in the final on 29 August.